Samantha Shannon was born in West London in 1991. She started writing in abundance when she was twelve, started her first novel when she was fifteen, and studied English Language and Literature at St Anne's College, Oxford, from 2010 – 2013, graduating with a 2:1. She specialised in the poetry of Emily Dickinson and Principles of Film Criticism. In 2013, she published The Bone Season, the internationally bestselling first installment in a seven-book series of fantasy novels. Its first sequel, The Mime Order, was published in 2015, and she's currently editing the third book in the series, The Song Rising. 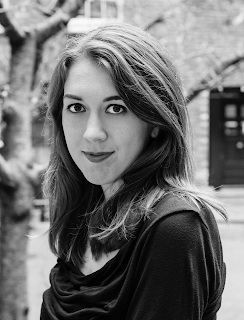 She is also the author of On the Merits of Unnaturalness and The Pale Dreamer, and has recently sold a new high fantasy novel, The Priory of the Orange Tree, to Bloomsbury. Just listening to you on the radio, your enthusiasm and attitude for everything your doing is persuading me to read your book, quite a bloomin' lot actually :-) Hope you manage to get Mr Cumberbatch to notice. Me too. He really is perfect for Jaxon. In my head Jax looks like John Waters! I loved knowing about your book and success at a young age :). I too wrote my first book at the age of 18 years old. It's more on self-improvement but I love getting in contact with young authors to share stories. I just finished reading The Bone Season and wanted to pass on a genuine heartfelt thanks for creating such a wonderful, invigorating story. I thought the way in which you developed your characters and the story was intriguing. I have already gone and recommended your book to several work colleagues and two of my managers who love reading, too. I honestly wish you the very best of luck with the forthcoming instalments of this series and cannot wait to get my hands on book two, whenever that is set to be released. I am just wondering if you're going to be doing any more signings in the UK, in Edinburgh or Glasgow any time soon? Thank you so much for the message. I'm really thrilled you enjoyed it! I don't think I'll be going back to Scotland for a while, but I'm trying to get Bloomsbury to set up a signing in London soon, as I live there and it's easy to reach. Just read the book, it was awesome. I loved the character development and the plot was great. Found it based on a kindle suggestion. I was so sad when it ended, the audio version was great. Can't wait to get book two in the series. Any idea on a publication date? Will you be touring in Chicago? Let us know if you get to the midwest of the US. Hi – I'm afraid I don't have any US tour dates planned at the moment. The publishers usually wait until the paperback comes out before they organise tours for debut authors. No official publication date for Book 2 just yet, but I'm hoping it will be 2014. Anyways, I'm very impressed with your book and would kill to see it as a TV series (i'd rather that than a movie since then all the details could fit in if it were a tv series). Great to hear you liked TBS! (And sorry for making you cry in the common room.) I'm afraid I have no scheduled appearances in Brighton at the moment – the closest I'm getting is Bournemouth on 31 October. But keep an eye on my upcoming events page! Bone Season was such a great book!! Truly was a good read and very excited for the next book in the series. I know it maybe too soon to tell, but is there a prospective time frame you may release the next book? I'm aiming for 2014. Glad you enjoyed the book! Hi Samantha, I simply love your book. I have not been able to put it down and only have the final chapter left, so am trying to delay reading it as I do not want it to end :( Also well done on this achievement at such a young age, you have great talent! And with regards to who could play Jax in a potential movie/TV series adaptation, what about Richard E. Grant? Hi Samantha, loved your book!!! I am so bummed it is over & i'm going through serious withdrawals. However i'm very excited to hear the next one is coming out in 2014. I am so happy for you & your success; especially the great news about a potential movie series... watch out Star Wars as The Bone Season could seriously rival the best of them! Keep up the amazing writing and all the best to you. I've been on a post-apocolyptic/dystopian society book binge the past few weeks and just finished "The Bone Season." LOVED IT. Very well written and imaginative. Now, I just have to try and be patient for Book Two. I thought your book was amazing and wanted to thank you for writing it. I enjoyed it immensely. I can't wait for the next one and the film! 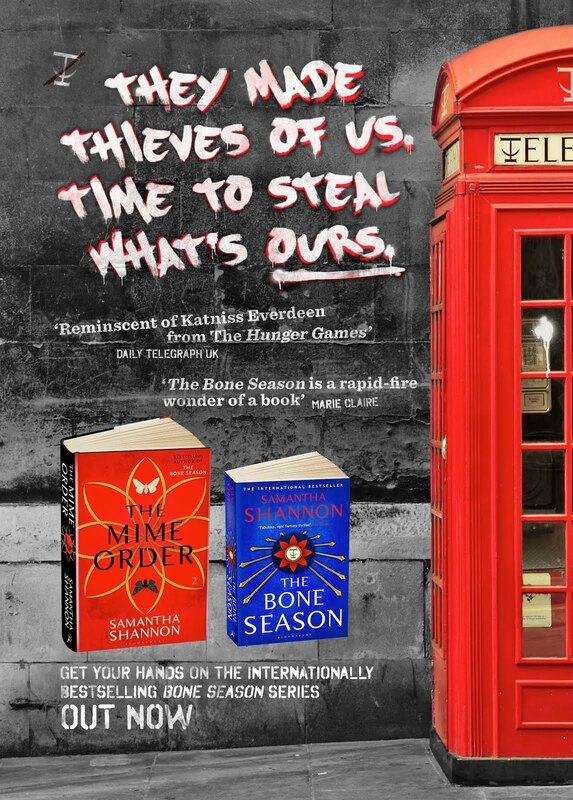 I loved The Bone Season! I had to ration it out because it didn't want it to end. I can't wait for the second book and I'm excited to hear about the movie. I'm a "book on tape fanatic" and just finished listening to The Bone Season.....amazing. Characters are so real and soooo excited this is one of seven!!! Can't wait for your next book! Heard your interview on NPR here in the USA and am about 60% through now. Really enjoying it. Great work for such a young author. You do not seem intimidated by the experience at all. Is TBS your first published work (any short stories, articles, etc)? Are you influenced by Phillip Pullman at all? I see a connection to London and Oxford in your bio, any connection to Ireland (Shannon)? I'm so glad you're enjoying it. It is my first published work, yes. I also have one published short story called 'Amrita', written for Vogue India. I deliberately avoided 'His Dark Materials' while I was writing the book, as I didn't want my Oxford to be influenced by Mr Pullman's, but I have since read 'Northern Lights' and loved it. And sadly no connection to Ireland – just a fascination with it due to my surname. I visited Ireland for the first time in 2012 and fell in love. My mother heard you on the radio and immediately was so charmed that she bought your book. After finishing it, she talked nonstop about how I had to read it, and how fabulous you were, so I picked it up to appease her nonstop persistence. Not only did I love your book, but it has opened up my creative mind into something grander than it was before. Needless to say my mother and I are already making predictions about book seven (none of them happy...just imagining a few brought me to tears) and are having arguments over who gets to read The Mime Order first. Thank you for making our conversations a tad more diverse and a ton more filled with fictional-character insults (the best kind). I can't wait to grow up reading your books. Sorry it's taken me so long to answer this! That's so lovely that you and your mum both enjoyed the book. Thank you so much for reading it. I hope you'll like the remaining six! Hey Samantha! I was wondering if you were ever thinking of coming to Queensbridge? Hello! As in, Hackney? It depends if my publisher schedules me for an event there. Currently reading the bone season and enjoying it but was wondering who your influenced by? Have you read any Brian Lumley? I'm glad you're enjoying it! I haven't heard of Brian Lumley. My main literary influences are Margaret Atwood, Anthony Burgess, George Orwell, and Emily Dickinson. Thank you for your reply. For yourself and your readers I think if they enjoy the world you are creating then they may also enjoy the Necroscope series by Brian Lumley. I am not advertising this just suggesting it. My email is jmdolanuk@yahoo.co.uk as evidence of this and my fb profile is Jim Dolan. Looking forward to the next in the series. Good Luck with it. I will have to resort to buying all my friends both books, forcing them to read them under Fear of of Scion and then be able to discuss all the twisty bits whilst waiting, rather impatiently, for the 3rd instalment! when to exit "The Mime Order" in Italia. I hope you're well. I run a writing/book blog called Novel Kicks and for the book club this month, I am doing booktober (4 books, 4 weeks.) One of the books I've picked is The Bone Season which I am looking forward to reading.